By Marc Eliot Stein, World Beyond War. Peter Phillips, professor of Political Sociology at Sonoma State University and media researcher for Project Censored and Media Freedom Foundation, presented a summary of his groundbreaking new book “Giants: The Global Power Elite” last week at Fordham University’s campus in Manhattan. This was an information-packed session that explained the unique purpose of this new book: exposing to public view the private workings of the influential investment partnerships, global councils, think tanks, consortiums and other non-governmental organizations that translate the agenda of the wealthy one-percent into policy plans and proposals that the most powerful governments in the world can act on. “Giants: The Global Power Elite” has a specific focus, which the author took the time to explain at the beginning of his presentation at Fordham. This is not a book about the wealthiest people in the world, nor about the most corrupt capitalists in the world. It’s about the small subset of both these groups that actually wields power by crafting policies, building alliances and gathering funds that governments adopt and carry out. This book describes the organizations that actually do the work of translating pro-wealth agendas into possible governmental decisions, and then provide the funding structures to ease the acceptance of these agendas. “Giants” aims to reveal where the rubber meets the road in global policy, from money managers like Black Rock and Vanguard Group to secretive facilitator organizations like the Group of 30 and the Bilderberg Group to, of course, military cheerleaders like the Atlantic Council, which acts as an unofficial policy-making and consensus-building arm for NATO. It should be no surprise that the military-industrial complex is fervently represented within the core of the global power elite. 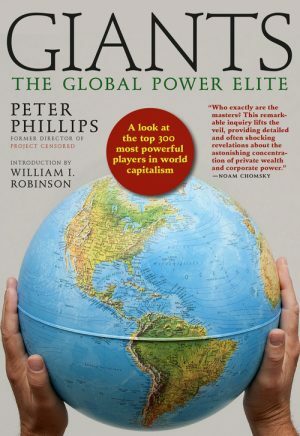 Peter Phillips devotes an entire chapter of “Giants” to the so-called “Protectors” who specialize in building consensus among various decision-makers to ensure that our planet’s sorry endless war never stops turning profits. This stark chapter emphasizes one disturbing new trend among many depressing old trends: the emergence of privatized for-profit military companies like Blackwater, identified here as a part of Constellis Holdings, and the lesser-known G4S. “Giants: The Global Power Elite” is valuable for not only describing the organizations that are most influential in global hyper-capitalism, but also describing the individual human beings who operate within these organizations. Much of the book is in “Who’s Who” format: biographical listings of heretofore-unknown names, arranged alphabetically and complete with details such as past and current employment, corporate board membership, educational history and known finances. The fact that this book is largely made up of listings makes it easy to peruse and quickly understand. The book is helpfully organized by section: Managers (finance), Facilitators (policy professionals), Protectors (military enablers) and, most interestingly, Ideologists (public relations professionals who mostly work within a couple of gigantic corporations, Omnicom and WPP). Phillips shares anecdotes and surprising historical facts to explain how these various groups weave their agendas into a toxic whole. Browsing through the listings of individuals produces surprising findings, such as the amazing repetition of the name “Harvard University” among these supposedly international individuals. Read together, these cryptic biographies reveal how insignificant national boundaries are to the wealthiest policy-makers in the world, who flit between USA, England, France, Germany and Japan, even as the policies they produce ensure that the citizens of the countries of the world will remain miserably at war against each other. Peter Phillips has written an important, well-researched book. It’s also an audacious book, because it dares to reveal the actual names and summary biographies of many secretive and wealthy power-players around the world. To reveal these names is an act of courage on the part of the author, and the publisher Seven Stories. The ugly global politics that permeates our lives leaves many of us feeling puny and helpless in the face of seemingly absolute power. Are we even allowed to write books like “Giants”, and to list the names of the individual people within the global power elite who craft and sell the positions that affect our lives? Is a cat allowed to look at a king? Is a political science professor and independent media researcher allowed to write a book that tells us exactly who the one-percent power brokers are, and what they are doing? Peter Phillips has written this book, and we can all benefit by understanding the facts within. Can’t wait to read it. It’s good to know who the enemies of democracy are. If they’re so powerful, why did they let Trump get elected? Hilary would’ve served their purposes just as well, but without blowing their cover. Yup! It most certainly is!